Susan Heim on Writing: The Mists of Time Book Tour: Giveaway for a $20 Amazon Gift Card and eBooks! The Mists of Time Book Tour: Giveaway for a $20 Amazon Gift Card and eBooks! "An edge of the seat read," notes Beck Valley Books. "Love, love, love this series!" He was destined to love one woman for eternity ... until The Fates interfered. 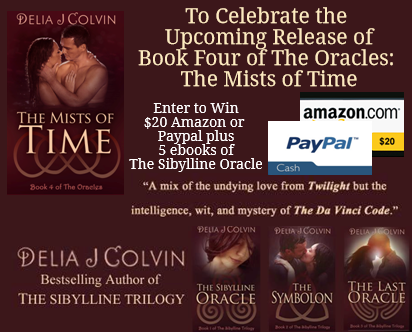 From international bestselling author Delia J. Colvin, the saga continues with Book Four of the bestselling Oracles series: The Mists of Time. Alex and Valeria are finally settled in modern-day Manhattan, but the past is shifting. When Alex's sister, Antonia, returns through an opening in time, Alex follows, and secrets are revealed that compromise not only Alex and Valeria's happy ending, but that of Paolo, Antonia and all of the oracles. Ready for a sneak preview before anyone else? "The Oracles does for Greek mythology what Outlander does for the clans of the Scottish Highlands!" Delia authors a popular blog and is listed as a contributor in two business books. While developing her skills as an author, Delia worked in a variety of occupations from marketing to entrepreneur, air traffic controller and Russian interpreter, but her passion is in writing and helping people. Delia has donated both time and money to literacy programs around the country. 4 more winners receive the ebook, too!